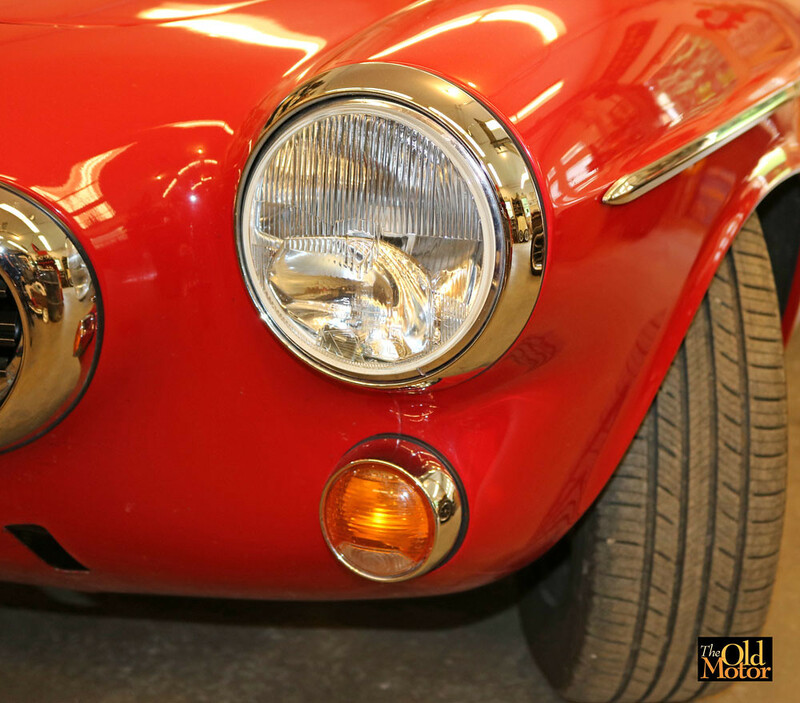 Recently added 1960s-1970s new old stock flat-faced French Marchal Ampilex halogen headlights to my '67 1800s. The low "city beam" bulb is in the reflector in the rear of the lamp, the high beam is a combination of the low beam light and a bulb in front of the small reflector. When on high beam w/all 4 lamps lit there are 440 watts of light produced or 3100 lumens. Based on these figures, I am wondering if any of you electrical whizz's can help me figure out what amperage headlight relay (or relays) are needed when all four bulbs are lit? Planning on adding a separate circuit for the lamps - what gauge wire should be used for these lamps and what size fuse? How many amps does the alternator need to produce without being strained to power a combination of all the lamps in the car and the high beam, windshield wipers, the ignition, and the original Volvo dealer installed Frig-A-King air conditioner blower motor has a 20 amp fuse. What capacity battery does the system need for this power load? 440 watts at how many volts? At 12 volts 440 watts is about 37 amps. @ 13.5 volts it's about 32. Lamps in that range should be fine with 14ga wire and 50 amp relays. But I'd seriously look at your alternator/generator. What's it's amp rating? When I had my 242gt with stock 35a alt, it struggled with the heater fan on 4 and headlamps and fogs (total ~285watts) on. Remember, watts is a measurement of work, not light. Thanks for your quick reply. I also need help with figuring out the other questions.
" How many amps does the alternator need to produce without being strained to power a combination of all the lamps in the car and the high beam, windshield wipers, the ignition, and the original Volvo dealer installed Frig-A-King air conditioner blower motor has a 20 amp fuse." "What capacity battery does the system need for this power load?" Just bite the bullet and stick a GM/Delco alternator on it instead of keeping the original style Bosch/Marchal/whatever (does that still have a generator on it?). Then you'll have to look around pretty hard to find one with a LOW enough amperage rating to be of any concern. Get a '3-wire' style and you'll keep the alternator warning light functionality. Plus you can reference the system voltage to somewhere other than the alternator output. But I'd be guessing that with high beams, heater fan on high, wipers on, A/C on as well (blower plus compressor clutch), all in all, I'd probably want 100A of charging on it. The battery capacity doesn't really enter into the picture, you're not running all of that stuff with the engine off. The alternator handles the electrical accessories, the battery handles starting it up, that's it. There's a lot of text there, but the basic premise is that you use always use relays, and you use a separate relay for the high beam and low beam circuits. I have not measured the draw on my lights, but I used 2x 20A relays and wired them through a small fuseblock in the engine bay. For something that draws that many amps I would use 12G wire. The suggestion to figure out a way to put a 100A alternator on your car seems like a good one as well. You will not be able to run those lights (at least not for very long) with your other accessories with anything less than a 60A alternator, and that's cutting it pretty fine. Is the car wiring all original right now? Are you trying to keep it that way? The last time I took my PV on a long road trip (to NC and back for 'Mountain Meet') the Marchal 140 system flaked out. And what are the odds of finding anything to fix that in the middle of Tennessee or Kentucky on a Sunday? Absolutely nil, even if it had the more common Bosch system on it. The brackets cost $130, then I got a brand new 75A alternator (all the PV needs, more really) for $55 shipped on eBay. If this alternator ever goes bad, pretty much *any* car parts place you find would probably have something that would work on the shelf. 10's of millions of GM's driving around with those things on them. The PO had it converted to a 2-wire Delco alternator but I do not know what its output is. On a '67 and later block it bolts right - no bracket needed. Would anyone know if the original generator light could be wired into the circuit? From my vague understanding, a '2 wire' Delco is like a 3 wire, it's just that the voltage reference is being taken at the alternator output. So you should have a heavier wire that would lead to the battery fairly directly, and the other wire should be the indicator light (12V+ switched to one side of the light, it grounds through this indicator wire to light it). Many people wire the 3 wire alternators up like 2 wire alternators anyhow, with a short wire going right over a couple of inches to the B+ output terminal, the Swem kit I got had a little 3 wire harness already setup like that. I didn't use it, though, I wanted to reference the voltage at the fuseblock to account for any resistance or whatnot in the 50+ year old electrical system. I have these for sale to run the Denso alternator. Yes but his car is a 67 which has the lower bolt for the alternator directly into the block. Not the bracket like that for 66 and earlier. Nice work though! I'm sure there is a Delco alternator that the lower bolt mounting would work on the block of the Volvo. Volts X Amps X power factor = Watts. Power factor is assumed to be unity (1), so its just volts X amps to get watts. Most incandescent marker lamps are ~1.5 - 2W each, so about an amp or two all said and done. Your blower motor should be 18A or less if it uses a 20A fuse. Worst case your lights operating at 12V would be the aforementioned 37A. For most electrical generating gear, you would operate it at 80% or less for continuous duty. With a 75A alternator, that totals 60A continuous. For operating amperage, that falls within the 75A alternator range. That said, I'm generally a fan of installing a larger alternator than is strictly necessary as the alternator doesn't have to work as hard and lasts longer (typically speaking). There usually isn't a size or much of a price difference between a 75A and 100A alternator. 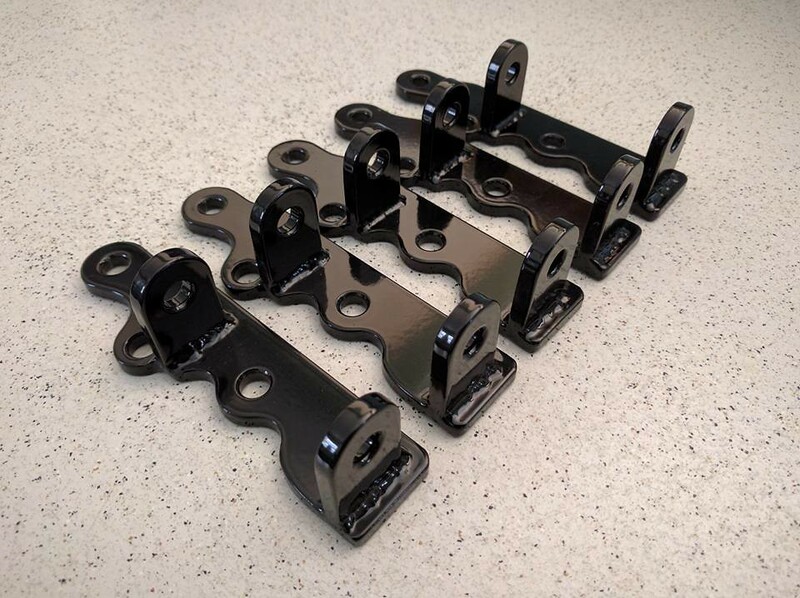 Personally, I would likely lean toward a GM CS130 or CS130D or 244 alternator mounted on one of those super nice brackets below. You can buy the plug that goes along with the alternator off of amazon or the junkyard. These alternators are super durable, the later models have dual fans and the 244 alternators (2006 ish to present) have super durable voltage regulators. If you go with the 244 alternator, be sure to get one that ISNT computer controlled. neither 130 alternator is. Finally, I would personally install a bunch of LED lights (especially on the headlamps) to drastically reduce the amp draw required. I *think* (but am not sure) that you'd have to slightly modify a Delco to fit on the block like that by drilling out the lower mounting tab and possibly grinding off some of it as well. GM didn't use a large single mounting tab like that, they used a smaller bolt with a bracket that supported it on both ends. Problem with modifying the alternator is that it could weaken it, and if you ever want to replace it in a pinch (broken down on the road) you can't buy one that bolts right on. My PV has a B20E block, with the alternator mounting bolt, but I wanted to use a very common bolt on alternator. Last edited by JohnMc; 12-11-2017 at 10:18 PM.. Thanks to all of you for your recommendations - I am an automotive and general machinist and mechanic and can fix or make most anything including rebuilding magnetos, but when it comes to auto electronics I am usually totally LOST. Thanks to cwdodson88 for mentioning that there are LED replacements - the hunt is now on for LED bulbs for the rear lamps that take a H3 bulb and the front bulbs that are H1. Once again when the high beam is on all 4 bulbs are lit. The car was already converted to a crudely modified Delco 2-wire alternator when I got it, but it has worked well for the 4K plus miles put on it this season. Based on Cameron's (Volvorelix) advice I think I am going to use a later Bosch unit w/a single mounting bolt w/enough amperage if I can find one and keep the Delco unit in the trunk for a spare. If LED's are available hopefully the amperage draw will be lower. 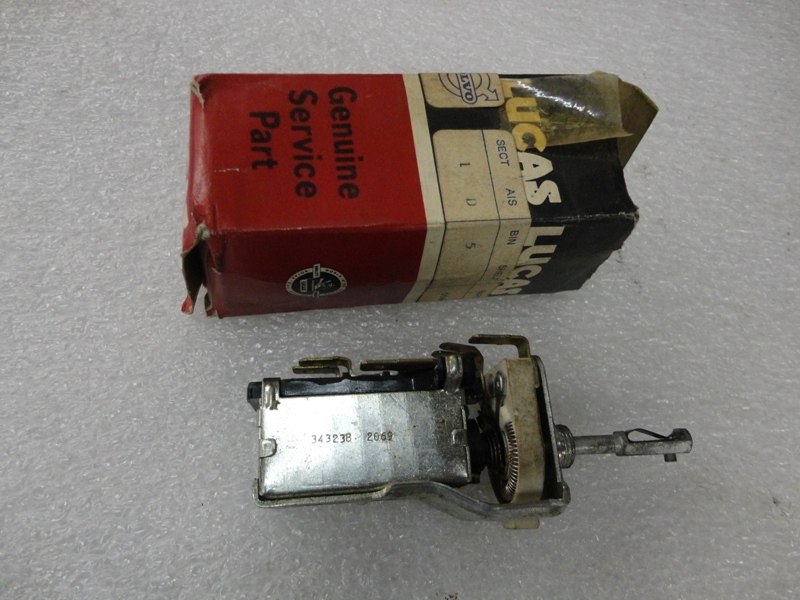 Am in the process of rebuilding the headlight switch that is an odd Lucas unit that my Lucas supplier tells me is not listed in his catalogs and the right relays will keep it from frying up. It is getting the best parts from 3 used switches. That sounds like you're spending a lot of time repairing a switch that could be put to better use. Get it now from him above before the smoke leaves the electrical parts! A reference to Lucas electric. The Prince of Darkness. I just tried LED headlight bulbs and due to the wide range in quality of the parts and quality of the light I ended up going back to high power halogen bulbs with a relay harness. $30 led bulbs were lower power and bright light. The light from them was also unfocused, created a lot of glare and light scatter. the high beams were worse. They were so bright it was like a ball of glare. Anyway, I went back to 100/90 H4 bulbs. Very nice focused light. I would suggest a quality higher power H1 bulb like a Narva 75 watt with a relay harness. You will like the extra light and have a harness to handle it. Even with all four bulbs on. BTW the Narva and Hella bulbs are cheaper than the led stuff. I have a set of H4 LED lamps. I got them from Vintage LEDs, but they have since become available through the amazon link for less. Same lamp. I had the opposite reaction. I did buy the (much) more expensive at the time Philips lamps as well as buying the Hella H4 housings. I think that your experience may have more to do with the housing (and associated reflector) than the lamp. The lighting is exceptionally even on the road, the H4 housing does a great job of having a razor sharp cutoff to prevent blinding people as well as throwing the light wayyyy down the road on high beam. The Philips lamps and a good H4 housing really transformed the night driving with this car on two headlamps. I previously had Hella 55/60W incandescent lamps in the same H4 housing. I bought an Amplilux headlight for my motorcycle back in the seventy's. A very rare item these days. Maybe the led bulb quality is the issue? I have brand new DJ auto H4 ecode housings on there. This is my 93 wagon in my sig. I was using the stock 55/60 bulbs before. Philips probably makes a better led product than what I tried. I may try them again from another maker sometime. 5k color better which the bulbs are closer to. On my turbo I have NOS Cibie Bobi DOT legal 7 inch headlights. Still using the stock 55/60 bulb and stock harness for now. But it is due for lighting upgrades. Optimally, the total load on the car would max out at 80% of the total output of the alternator in order to keep the battery charged. While a big battery can help, what insures the voltage is maintained is the alternator. The alternator needs to be big enough to maintain battery voltage. Larger capacity batteries can help handle the load when idling, and surge loads exceeding the available alternator amperage, but really you want more alternator. The CS130D as mentioned above can work, but I prefer the AD244 or DR44. Larger diameter stator and rotor, better low-speed performance, and only slightly larger in diameter than the 130. The DR as installed from the factory in GM SUV's will do 170amps at 1800rpm of engine speed, 105+ amps at idle, with 3:1 pulley ratio. It's what they use on their SUV's with heated seats and windshield. ALL DR's are PCM controlled, so you would just swap in the earlier regulator like the CS130D or AD244, and a 2v pulley, and enjoy. Get it now from him above before the smoke leaves the electrical parts! Thanks again to all of you - there are many ideas to consider here. I have brand new DJ auto H4 ecode housings on there. You answered my question right there. I had a set of DJA ecodes on my wife's wagon and put a set of the LED lamps in there. In that setup, the lenses on the DJA were TOTALLY incompatible with the LED lamps. It was horrible. I ended up putting incandescent lamps back in and they worked better. I later took out (and sold) the DJA in favor of OE Volvo NOS replacement housings with good incandescent bulbs. No matter what I did with the DJA housings, the reflectors were so sh*tty that they still sucked. The stock replacement with a good set of bulbs made her (and as a result me) much happier. The LED lamps work great on the older round or quad square housings, terribly on the large housings. I put some in my 89 240, and yeah, the need a different reflector or a baffle, unless they’re the 4 sides ones, those are 2 side low and all 4 for high beam. I got the 3 sided bulbs and had to put electrical tape in a line over the lense to give me any cutoff. So I’m making some baffles to give me a good cutoff and still allow the high beam to function. For the round housing it’s great, and with the clean cutoff of those marchal housings, I think they’d be great. Ah, that you for the info on the lighting. Yeah, the DJ auto are a compromise but they are a better unit than the US plastic crap. The led bulbs I tried were the three sided ones. I eventually also bought four sided ones to try. I haven't yet though. I am really happy with the halogen bulbs and will run them. I still don't like that bright white 6-6.5k color. With this information I may try the four sides leds in the turbo. That has the 7" round housings from Cibie which also have a nice cutoff. Maybe the color won't bother me too bad with a good cutoff. I put a 79 242DL front on my 82 turbo.